Disability rights campaigners and women’s groups have gathered outside the supreme court, where judges will consider appeals that claim the government’s bedroom tax is discriminatory to vulnerable people. The outcome of the case could have implications for disabled children, hundreds of victims of domestic violence and thousands of disabled adults. For Paul Rutherford, the grandfather of a disabled child from Pembrokeshire, the hearing represents the latest round of a legal battle which he has fought for three years. 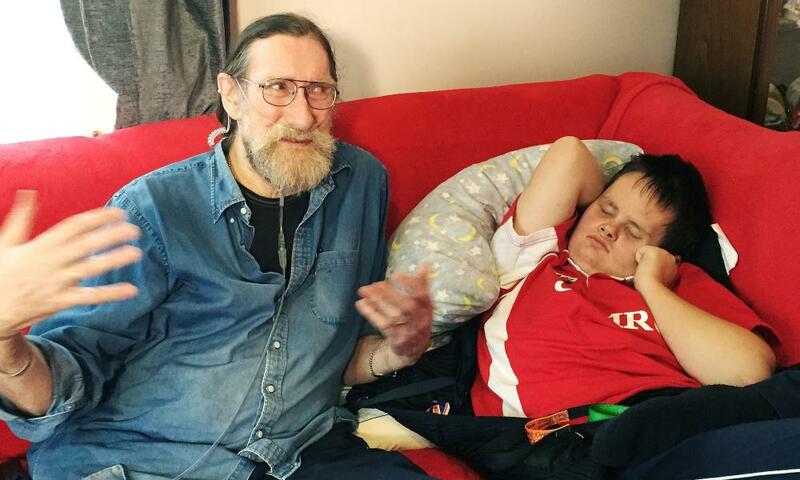 “If the government are going to do this to people like us, who is next?” said Rutherford, who looks after Warren, 15, with his wife, Sue, in their three-bedroom house, which has been adapted to meet their grandson’s needs. The so-called bedroom tax was introduced under benefit changes in the Welfare Reform Act 2012. Tenants in social housing have their benefits reduced by 14% if they have a spare bedroom, or 25% if they have two or more. Warren needs an extra bedroom for an overnight carer. Last month, the court of appeal ruled that the bedroom tax was discriminatory in the cases of the Rutherfords and a woman identified only as A who had a council house fitted with a panic room to protect her from a violent partner. The court held that the bedroom tax unlawfully discriminated against children with disabilities, contrary to article 14 of the European convention on human rights. The Department for Work and Pensions appealed against the decision and the supreme court announced the case of the Rutherfords and A would be heard by seven justices alongside several other bedroom tax challenges already due to be considered. The DWP rejects the term “bedroom tax”, saying that the regulations amounts to the removal of the spare room subsidy, aimed at encouraging families to move to smaller properties and reduce the housing benefit bill. It has argued that the regulations are not discriminatory for people like the Rutherfords and “A” because they have given councils the funds to provide discriminatory housing payments to those who need them. Lawyers for the Rutherfords have submitted evidence to the court they say will help to prove their case and demonstrate the ineffectiveness of the discretionary payments. A survey of local authorities in England, carried out by the Child Poverty Action Group, backing the Rutherfords’ case, shows that 41% of councils have policies that only provide discretionary housing payments (DHP) for a short-term period, while 28% of councils have policies where DHP can only be granted for a specified finite period, for instance, three, six or 12 months. The changes to housing benefit that resulted in the removal of what the government calls the spare room subsidy came into play in April 2013. Since then, families who have been classified as having spare rooms have received reduced benefits. The panel of judges, headed by the supreme court president, Lord Neuberger, will hear arguments over three days in the government’s challenge over the Rutherfords and A. Another part of the hearing will relate to an earlier decision made by court of appeal judges over a complaint by a number of disabled people that the regulations unlawfully discriminate against disabled adults who have a need for another bedroom because of that disability. The high court dismissed their application for judicial review and their subsequent challenge against that ruling was rejected by appeal judges in February 2014. A DWP spokesman said in a statement before the latest round of the litigation: “Removing the spare room subsidy has restored fairness to the system for claimants as well as the taxpayer, and the numbers subject to a reduction are falling. “We know that there are cases where people may need extra support – but rather than put in place complex exemptions, we have given local councils the freedom to decide what is best for their communities.